Michael Eavis, who holds the musical extravaganza on his farm in rural Somerset, said the two-hour performance - complete with fireworks and a burning phoenix on top of the stage - was worth the wait. He had tried to secure the band, celebrating their 50th anniversary, for years and said he was not sure how next year's headliners, who have already been booked, would live up to the Stones. "It was 43 years in the making, 50 years for them, and we've finally come together. We're on the same page at last," Eavis said, on the third day of music at the festival. He claimed it was his highlight of his time running the festival, which was first held in 1970. The 77-year-old, who organises the event with daughter Emily, said: "It's the whole razzmatazz of the occasion - the two of us finally getting together at long last. I had to prove myself to them. We were a bunch of hippies; it's hardly a Rolling Stones set up, is it?". The capacity of the Pyramid area was expanded for the first time for the Stones, meaning a festival record of 100,000 saw Sir Mick Jagger strutting his stuff. He led the band through their classics, starting with an energetic Jumpin Jack Flash and ending with a soulful You Can't Always Get What You Want, before crowd-pleaser Satisfaction. 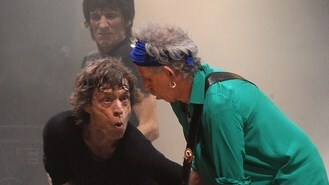 Jagger was said to have been concerned about sound quality ahead of the gig, but his fears were unfounded. "Musically, they were absolutely brilliant," said Eavis, who claimed the band were number one in his top 10 of headliners, above Radiohead, U2 and Oasis.